With temperatures getting warmer and summer looming, you may be wondering when to fire up the dehumidifier. During the hot days of summer your air conditioning system will usually do a fine job of keeping indoor humidity in check. But what about those cooler days when your A/C won’t kick in, or runs for only short periods of time? Or what if you don’t have central air? Your indoor humidity levels may get too high, which could contribute to the growth of mold in your home. Here are some of examples of when to use a dehumidifier. Imagine a low- or mid-70 degree day with high humidity, say 75 or 80%; maybe it’s rainy or foggy. That external humidity will seep into your home, raising your indoor humidity. Add to that the fact that we contribute our own fair share of moisture by bathing, cooking, cleaning, and just breathing. Now you may have an uncomfortable level of indoor humidity. Even if you exhaust some of that humid air, you’ll still have humid, outside air coming in. Under these conditions, it’s not hot enough to run the A/C. You may even have the windows open. So how do you handle all that indoor humidity? This is a perfect case where a dehumidifier will come in handy. Any relative humidity over 60% allows mold to grow. Since mold spores are everywhere, you will have mold growing in your home at that humidity level. But will this mold growth be troublesome? That all depends. How sensitive are you to mold? How long does the high humidity condition persist? Is there a food source for the mold to grow more quickly? Mold “food” can be dust and dirt in the air or it can be more substantial, organic materials such as “was wood.” These are products (furnishings and building materials) made of pulverized wood reconstructed with adhesives. Other building components like standard sheet rock can also be good environments for mold to grow in. In the long run, even if mold growth is minor, it’s a good idea to keep it under control by managing your indoor humidity. Again, that’s when you’ll want a to have a dehumidifier. Dehumidifiers are available as duct mounted or portable models. Duct mounted are an integrated part of your HVAC system and cover the entire house. Portable models are standalone and typically cover a single room or smaller area of the home. Duct mounted models have definite advantages. They are higher capacity and require less regular maintenance—no collection pans to empty. Most have accurate digital controls and many can be controlled by the same thermostat that controls the HVAC system. 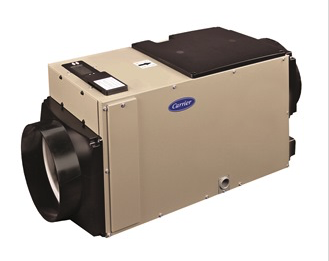 High performance A/C systems with ECM motors and special humidity controls (like the Carrier Infinity systems) can improve humidity control on mild summer days, even allowing a little bit of overcooling to remove more moisture. But you may still need a separate dehumidifier to control humidity on those high humid, mild temp days—whether it’s a simple portable unit or a duct mounted model. What is the Proper Level of Home Humidity? Bypass vs. Fan-Operated: Which Central Humidifier is Best for My Home? Should I Dehumidify My Home? Signs It's Time to Take Action.